Reconnect to your true essence on our 6 day retreat. Set on the magical island of Ibiza, in a 300 year old reconverted finca. A serene and stimulating refuge from the rest of the world, aiming to inspire spiritual development and communing with nature. Be nourished with plant-based, seasonal, organic meals made with love by Saba. You will receive daily healthful brunches, mid afternoon snacks and vibrant dinners. All dishes are refined sugar free, and gluten free to help heal and revive your body. Connect to the earth through food meditations, and mindful eating practices. Discover how to create deliciously simple plant based dishes and use food as medicine. Dive deep into yourself through the practices of Hatha, Yin and Restorative Yoga and allow yourself the time and space to reset in nature. Explore the local beaches, forests trails, and artisan markets & rediscover yourself through movement, heart opening cacao and sound ceremony. Re-treat yourself with our portfolio of Ibiza’s best healers and practitioners, taking the time to rest, reset and nurture yourself in the enchanting North of the island. We offer this retreat with all our love and look forward to welcoming you to this sacred space. Our first farm-to-table pop up of 2019 will be held in a lovely location next door to a permaculture farm from where we will be sourcing our organic produce. Winter produce is still growing in abundance. There will be greens, packed with phytochemicals, vitamins, minerals and fibre. And we will infuse our dishes with bright citrus colour and flavour. As always, our multiple-course gastronomy extravaganza will be served family style, including appetiser, entree, mains, dessert. The price of €30 includes the lunch, welcome drink, water, tea and chupito! Local Ibiza wine and beer will be available at an extra charge. We donate €1 from every guest to Ibiza Produce, a project from Ibiza Preservation Foundation. Understanding the relationship between our gut and our brain is vital to harmonious health. Location: San Juan, will be distributed upon registration. Join Advanced Certified Jivamukti yoga teacher Emma Henry for a yoga retreat in Iceland in October. We are based in the wild and remote Troll peninsula in northern Iceland in a luxury ski lodge set at the end of an incredibly beautiful valley surrounded by mountains. Your Iceland yoga retreat combines dynamic yoga with options to hike, ride Icelandic horses and watch whales in the fjords. A day exploring Lake Mývatn, a sunset soak in hot pools overlooking a geothermal paradise and the magical Northern Lights make this yoga retreat one of our most exceptional travel experiences in Europe. During your yoga retreat you’ll be served daily delicious, healthy brunch, dinner and snacks each day – prepared by our expert retreat chef Saba Rahbar. Our menus are designed to support your yoga practice, so you can expect tasty and sustaining plant-based meals. Join Emma Henry for a yoga retreat in the wild, remote north Iceland. Sleep in a luxury ski lodges set at the end of an incredibly beautiful valley surrounded by mountains and combine dynamic Jivamukti yoga with options to hike, ride Icelandic horses and watch whales in the fjords. A day exploring Lake Mývatn, a sunset soak in hot pools overlooking a geothermal paradise and the magical Northern Lights make this retreat one of our most exceptional travel experiences in Europe. Join Saba (Treehouse Ibiza) & Rita (Sweet Fix by Rita) for a raw vegan dessert workshop. We're bringing together our love for deliciously nutritious sweet treats packed with gut healthy goodness! Introduction to plant based cooking to help guide you on your path to conscious eating. You will get tips on how to stock your pantry effectively and economically, plan your meals for the week, and have recipe inspiration to take home. - Hands on cooking class to learn how to make 3 easily adaptable dishes. We will end by sharing the creations of the day together around the table, family style. I'll be cooking on Laura Farrier's Ibiza retreat! Join us for a week of daily meditation, yoga, workshops & lectures while discovering the magic of this beautiful island. We are back! Our first farm-to-table pop up of the season will be held on a well known and much loved farm. Winter produce is still growing in abundance and we also have a few spring veggies to play with. The stars of the show will include cauliflower, cabbage, broccoli, artichokes, colourful chard and other friends. Arrive at 1:30pm to have a guided tour of the farm. Children will even get to pet the animals. Lunch will be served in the farm's restaurant area. As always, our multiple-course gastronomy extravaganza will be served family style, including appetiser, entree, mains, dessert. The price of €38 includes the lunch, a non-alcoholic welcome drink, water, tea and chupito! Local Ibiza wine and beer will be available at an extra charge. We donate €1 from every guest to Ibiza Preservation Fund. Kick start your New Year with a healthy yoga weekend to blast away the winter blues. Your detox yoga weekend includes plenty of vinyasa flow yoga with Faye Riches. Get ready to dive into to ten hours of classes and workshops that will leave you feeling refreshed, energised and ready for 2018. Between classes relax in our luxury private manor house. Our yoga weekend chef will fuel you with a delicious vegetarian menu and you can add massages and country walks for the perfect healthy weekend. Introduction to plant based cooking to help guide you on your path to conscious eating. We will focus on the theme of food frequencies and explore how high vibrational foods (fresh fruit and vegetables, minimally processed foods) and low vibrational foods (highly processed foods, GMO, animal based foods) effect us individually, and collectively. You will get tips on how to stock your pantry effectively and economically, plan your meals for the week, and have recipe inspiration to take home. - Hands on cooking class to learn how to make 3 easily adaptable dishes plus plant milk demo. The final farm-to-table pop up of the season set on a gorgeous Permaculture farm in the hills of San Jose. Autumn brings with it an array of colours and flavours...beautiful yellow quinces, bright orange pumpkins & sweet potatoes, ruby red pomegranates and luscious leafy greens. Lunch will be served up above the tree tops with views of the farm, green rolling hills and Formentera! Arrive at 1:30pm to walk down the valley and have a guided tour of the farm. *Please make sure you bring comfortable walking shoes. Head back up for a multiple-course gastronomy extravaganza served family style, including appetiser, entree, mains, dessert. The price of €35 includes the lunch, a non-alcoholic welcome drink, water, tea and chupito! Local Ibiza wine and beer will be available at an extra charge. Space is limited so please email campocomidaibiza@gmail.com to save your seat! "A 5 day Jivamukti yoga holiday, exploring the mountains and geothermal wilderness of north Iceland with Emma Henry. Time seems to stand still here and practising yoga and meditation in the Icelandic wilderness can be a liberating and powerful experience. North Iceland in October is the ideal setting to watch the Northern Lights and our remote location with no light pollution means that if they happen, we’ll have a fantastic show! Your yoga holiday will include 12 hours of yoga and meditation classes with Emma Henry. Your yoga holiday meals will be prepared by our expert chef Saba Rahbar, who will prepare you delicious, nourishing and warming vegan meals. Join Aram Raffy & Saba Rahbar in Ibiza for a yoga & wholistic food holiday. 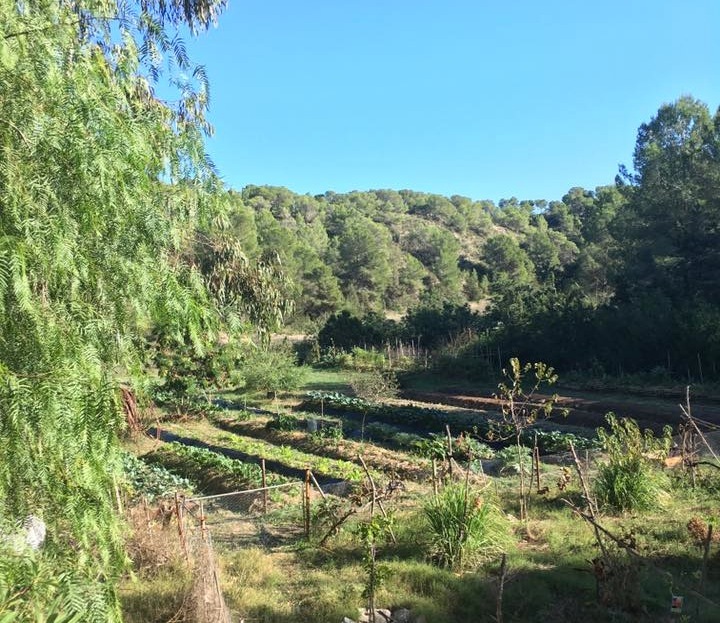 The retreat will be held in a traditional 200 year old Spanish finca with luscious views of rolling hills, and the wonderful sound of Ibizan birdsong. The daily yoga practice will take place on a shaded terrace overlooking the stunning San Vicente Valley, while the cookery workshops will be held in a traditional farmhouse kitchen, using locally sourced ingredients. After a nutritious brunch you can relax by the pool, or if you’re feeling adventurous you could sample one of the several walking trails nearby. There is also a beach closeby, just a 5 minute drive away (or a 20 minute walk). Delicious and nutritious daily brunch, healthy treats, snacks and dinner (except for one night) made using locally sourced organic produce. 100% plant based, refined sugar free & gluten free. *if you have any special dietary requirements please let us know when you book. There is a wide range of extra treatments and activities available from trips to local artisan markets, massages in the villa to stand up paddle board classes which can be booked at an extra cost. Aram has travelled the world studying and teaching Yoga. As a native of London he currently teaches packed out classes at some of the city's top Yoga studios to people from all walks of life. He is known for his fun, uplifting style of Astanga vinyasa-krama. A student of both Eastern and Western philosophy, he seeks to pass on the spiritual essence of Yoga through a powerful physical practice, deep conscious breath-work and active meditation. All set to a varied soundtrack, with conscious adjustments and an unmistakeable sense of humour. His classes are dynamic, challenging and all inclusive. His nature is generous, encouraging and he seeks to help all his students to harness their deeper potential. Yoga for upliftment! Saba is a wholistic chef, certified in plant based nutrition. Her discovery of plant based foods started four years ago after she became ill and embarked on a powerful journey to health and wellness. This journey has not only helped Saba heal herself, but has enabled her to empower others with the tools they need to reconnect with their bodies through food. Her wholistic view on nutrition takes into consideration the mind, body, soul connection and looks at food from a much broader perspective. In addition to regularly working as a chef on some of Europe’s best wellness retreats, she runs fun & informative cooking workshops, has a product line of healthy snacks and has also co-authored a book. Prices are per person and include accommodation, classes, daily meals (excluding one evening where you go out to a local restaurant). There is a £120 surcharge for single occupancy rooms. Travel and transfers are NOT included. 50% deposit required to secure your place & room. Monthly payment plans are also available upon request. Ibiza only has one airport and there are daily direct flights on Easyjet, British Airways & Ryanair from London. As well as Iberia & Vueling flights from Madrid & Barcelona. Transfers by minbus/taxi can be arranged (not included in price) OR we also recommend hiring a car for ease of exploring the surrounding area. Send an email to Aram at info@aramyoga.com to set it all up for you. We can't wait to see you, but we know life happens. As spaces are limited we will endeavour to treat cancellations sympathetically. Cancellations before June 3 deadline will be fully refunded. After June 3, if a replacement booking is secured from a wait list, monies will be returned (minus an admin fee of 10% of the cost of the retreat). If a replacement is not found, deposit(s) paid according to payment schedule will be retained. Cancellation of your booking, for whatever reason, should be notified in writing by email. Another fabulous farm-to-table experience awaits you! Summer brings us the most colourful produce...bright red juicy tomatoes, sweet watermelons, deep red beets, luscious figs, bright green basil, mellow yellow zucchini flowers and lots more. We will be championing authentic Ibiza varieties of summer fruits and vegetables. The main acts will be tomatoes and watermelons, with the white aubergine, Ibiza's 'pimienta blanca' (salad pepper), the local 'cebolla roja' (red onion), melo erico (white melon variety from Ibiza) and a few others as supporting acts. All sourced from the ecological farm where we host the dinner. You will also have the chance to buy some veggies harvested on the day of the event. Now that's what we call fresh produce! A multiple-course gastronomy extravaganza including appetiser, entree, mains, dessert. The price of €40 includes the dinner, a non-alcoholic welcome drink, water, tea and chupito! Local Ibiza wine and beer will be available at an extra charge. €1 from every guest will be donated to Ibiza Preservation Fund. Like Deliciously Sorted Ibiza put it so nicely the other day, It doesn't get more Farm to Table than this! Our third Campo Comida Collective event will be a solstice sunset dinner set in yet another charming organic farm close to San Rafel. The multi-course menu will tantalise your tastebuds with our creations using this month's fresh produce from the farm. You will also have the chance to buy some veggies harvested on the day of the event. Now that's what we call fresh produce! The price of €40 includes the dinner, a non-alcoholic welcome drink, water, tea and chupito! Local Ibiza wine and beer will be available at an extra charge. Following the success of our first Campo Comida Collective pop up, we have another delicious lunch in store for you! Once again we will tantalise your tastebuds with Mediterranean & Middle Eastern infused dishes made using locally sourced, fresh, organic ingredients. The star of the show will be this season’s favourite, the Strawberry. A multiple-course gastronomy extravaganza including appetiser, entree, mains, dessert, herbal tea & wine/beer. This will be an opportunity to take part in the authentic Farm-to-Table experience as we will be hosting you on an ecological farm, close to San Rafael/ Forada. *Places are limited so please email campocomidaibiza@gmail.com to reserve your spot. **all food will be predominantly local, plant based, unprocessed & refined sugar free.